Top Spot for part-time MBA programme in Ireland for second year running. The QS Executive MBA rankings 2018, published on 26 April, place Trinity Business School 1st in Ireland, 22nd in Europe, and 52nd in the World. For the second year in a row the Trinity Executive MBA has been ranked number one in Ireland by the internationally renowned QS Executive MBA rankings. The programme has also risen in the European rankings, a significant achievement given that many other Schools have entered the rankings during the same period. In particular the School has scored highly for the quality of its students, especially for the large number of class members with managerial and executive level experience, and for the strong increase in graduate salaries on completion of the programme. 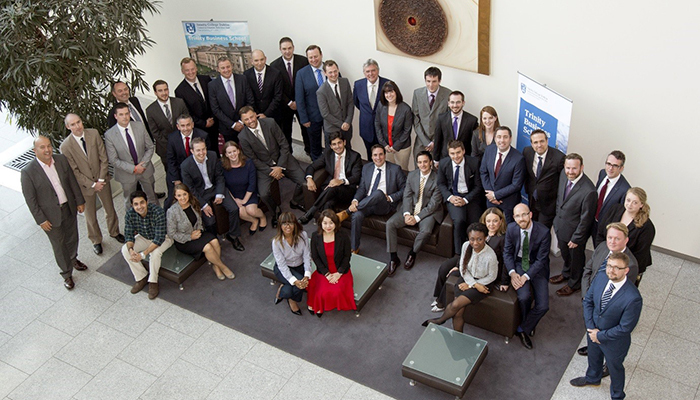 This past academic year the Executive MBA has grown enabling the class to become even more international and diverse: the programme was awarded 100% for female participation. Trinity Business School is committed to increasing the number of women in leadership positions in organisations of all sizes. The Trinity MBA in collaboration with the 30% Club offered full and part-time scholarships to talented women to provide them with the opportunity to move into executive positions. Trinity Business School has embarked on an ambitious growth strategy, growing over 78% in the past two years alone. An on campus €80 million building to facilitate the expanding School is due to be completed in early spring 2019. The growth of the School is in large part driven by its unique location in a world-class university at the heart of Dublin, a thriving global business hub with internationally focused industry - both global and domestic MNCs and born-global start-ups - on its doorstep. The international focus of the School serves students as they progress into careers both in Ireland and abroad.